Ahh man I hope they at least have the launch usable at Sampson since I reserved campsites there months ago...We have always camped there for the derby. It will be painful if we have to trailer else where to launch. Headed up in the morning hope the bite is still decent. What boat launch should I use? I've used Warrens tackle shop launch a few times however I will probably be launching before they open. Does anyone have any other suggestions not a huge boat 21' aluminum pretty easy to launch and retrieve. Thanks in advance! Ahh it's nice to see the ole vessel. 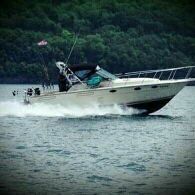 I owned this boat quite some time ago...take a look at my signature picture It's the back of that boat lol maybe I should update my picture haha. I caught a lot of nice fish from that platform. Glad to see it's still going and best of luck with the sale! Very Interested where are you located? Also I do realize this is a fish finder only but do you know what generation unit it is?